Twice the bridesmaid, popular West Coast Eagles midfielder Matt Priddis finally was the centre of attention when he won the inaugural John Worsfold Medal as the 2013 Club Champion. Priddis, runner-up in 2010 and 2011 to Mark LeCras and Darren Glass, won the coveted title as West Coast’s best at the awards ceremony at Crown’s Grand Ballroom tonight. In doing so, he became the first recipient of the John Worsfold Medal, struck in honour of a man who has played the most significant role in West Coast Eagles history. Worsfold ended a 24-year connection to the club as a player and coach when he resigned in September as senior coach. Priddis was rewarded for his ultra-consistent performances when he topped the count with 373 to win from emerging key defender Eric Mackenzie (367) and star forward Josh Kennedy (363). Going into the night it was widely expected that those three players would lead the way, so the result came as no surprise. Under the voting system, five members of the match committee rated each player on a scale of 1-5, meaning that an outstanding game could result in a maximum of 25 votes. Priddis and Kennedy both played in 21 matches while Mackenzie played in 20 games, missing two games early in the season with a hamstring strain. It was a big night for Priddis, who was formally anointed as a life member, having reached the qualifying mark of 150 games in the round 22 clash against Collingwood at the MCG. He is another of the outstanding players to have made his mark at the elite level after initially being rookie listed. Overlooked in a couple of drafts because of a lack of leg speed, he continued to prepare himself to play at his optimum until he was drafted with selection #3 in the 2006 rookie draft. 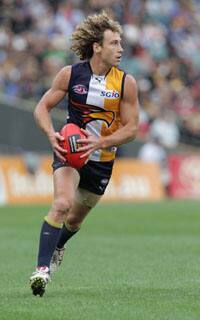 He was elevated to the senior list in that season and debuted in the spectacular come-from-behind victory against Geelong at Skilled Stadium when the Eagles pegged back a 53-point deficit in the third term to claim one of their greatest victories. Mackenzie and Kennedy, who led the Coleman Medal race for much of the season, both made the preliminary all-Australian squad of 40 and were unlucky to miss positions in the final team. Joining Priddis, Mackenzie and Kennedy on stage, by finishing in the top five were champion ruckman Dean Cox and emerging forward Jack Darling. Other significant awards were won by Adam Selwood, who won the Chris Mainwaring Medal as best clubman and ruckman Scott Lycett, who was named rookie of the year. Life memberships were also afforded to long-serving stalwarts Chris Summers, Peter Souris and Ken Godwin.